Today I am sipping tea in a fun mug that I found years ago. 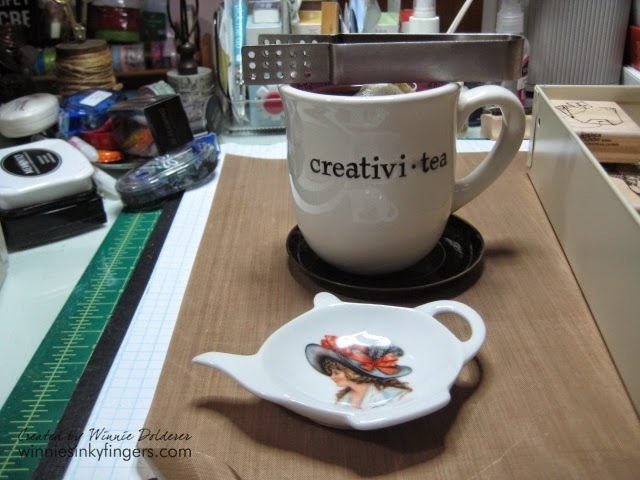 It brings together two of my passions, crafting and tea! Inside the mug the definition of creative-tea is noted as: n. Having more creative ability while drinking tea. Very true in my case. I find I create better with a nice cup of tea at hand. Isn't the tea bag holder lovely? My mom knows how much I love vintage images and when she saw a set of these with various ladies on them she knew she had to pick them up for me. Mom said they would be perfect for tea parties, especially for my friends in our Jane Austen group! Currently, I am going through my tea related stamps to come up with a birthday card for a dear friend. 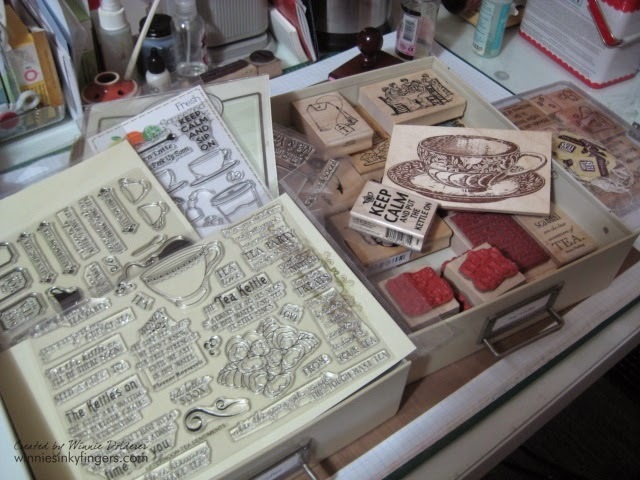 I have a couple of drawers dedicated to tea stamps, and many more in sets. Part of the fun of card making for me is the process of going through my stash and picking images that "fit" a recipient. I hope to share what I come up with later in the week! Tea does inspire creativity as well as a lot of other things. I find it soothes and relaxes me. Those tea bag holders are very cute and surely come in handy. I have a set decorated with, what else? Roses! It's lovely to have you joining me for tea again and have a beautiful day. I love your creativi-tea mug. It's wonderful. And the tea bag holders would be perfect for your Jane Austen group ... lovely find by your Mother. Wonderful collection of tea stamps. I need to add tea things to my stash and just don't find them. Happy Tea Day! Very envious of your tea stamp collection. I have one, but would love more. Hope to see you Friday at the Anything Goes linky. I love your clever Creativi-tea mug! I am also in awe of your vast collection of tea related stamps, since I never imagined there were so many of them. Hope you found the perfect one for your friend's B-day card! I need to search out my rubber stamps for tea stamps. I know I have some. Just haven't stamped in awhile. You certainly have a great collection. You have some great tea stamps! Lovely! I love your creativity mug, it's awesome! Your tea related stamp collection is simply amazing, my friend. I'm sure your friend is going to adore the card you will create for her B'day.